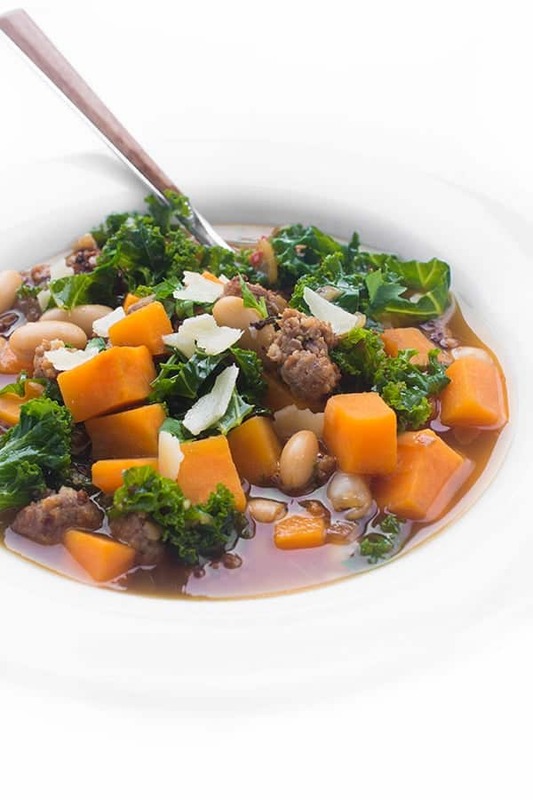 This simple and satisfying soup is packed with Italian sausage, hearty beans and plenty of fresh veggies to create a healthy meal-in-a-pot. Soup is probably my number one comfort food, aside from my Aunt’s Middle Eastern specialties. 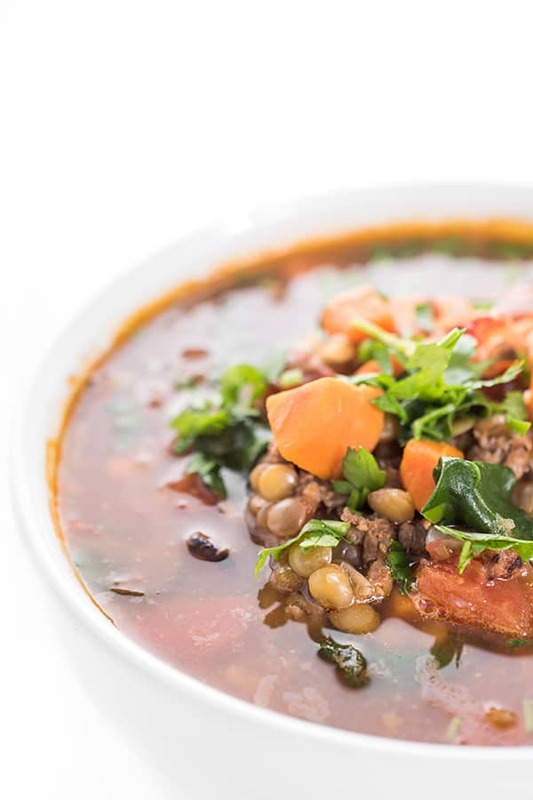 Warm, satisfying comfort in a bowl – I love that you can transport yourself to any part of the world by varying the flavors and ingredients. 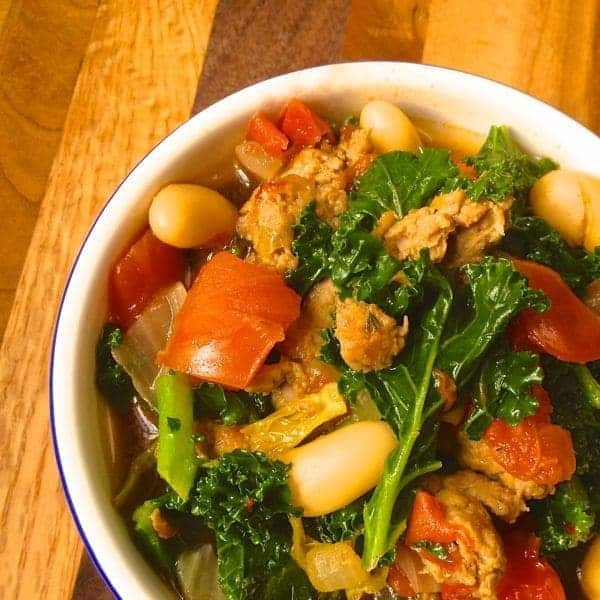 This Italian Sausage and Bean Soup is a nod to my husband’s Sicilian roots. Love Middle Eastern food? 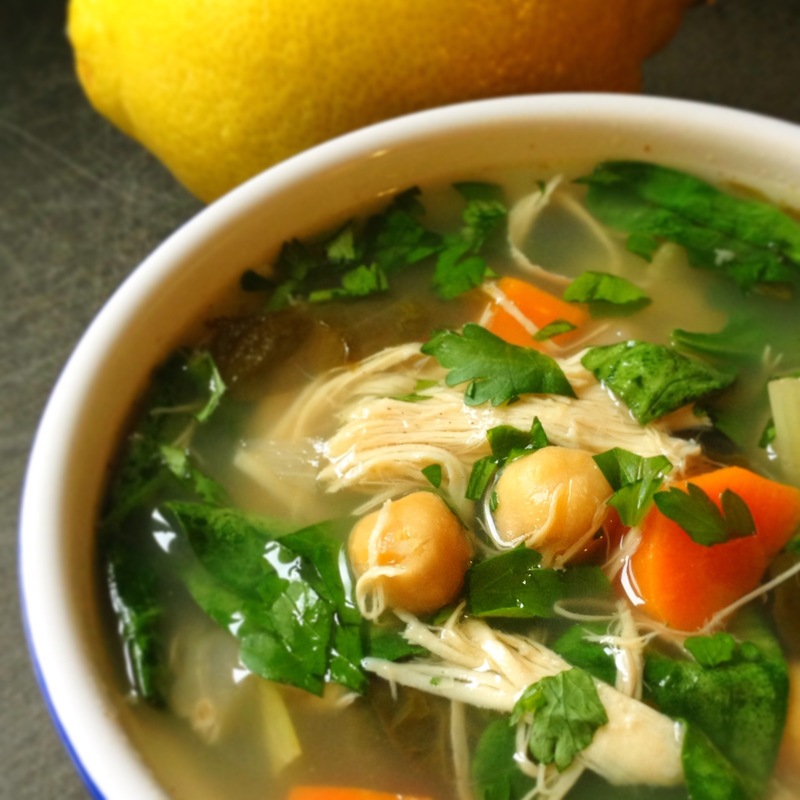 Lemony Chicken Soup with Greens is flavored with cinnamon and plenty of garlic. Craving Tex-Mex? My award winning Sweet and Smoky Turkey Chili is guaranteed to please. Feel like heading to Asia? Try my 5 Minute Wonton Soup. Since my husband loves any and all Italian food, I decided to make a pasta-free version of Minestrone. The fennel and garlic in the sausage adds tons of flavor to the vegetables and beans without requiring you to add many other spices. Of course, I couldn’t stop myself from adding more fresh garlic and a pinch of chili flakes but you could get away with skipping those added ingredients. Are these beans not the most beautiful site you’ve ever seen? I picked up this fun little mixture of dried beans at a local farm and thought this soup would make a great home for them. If you don’t have dried beans or don’t want to bother soaking them overnight, go ahead and pick two cans of your favorite legume. Cannellini, kidney or navy would be great choices but any bean works! 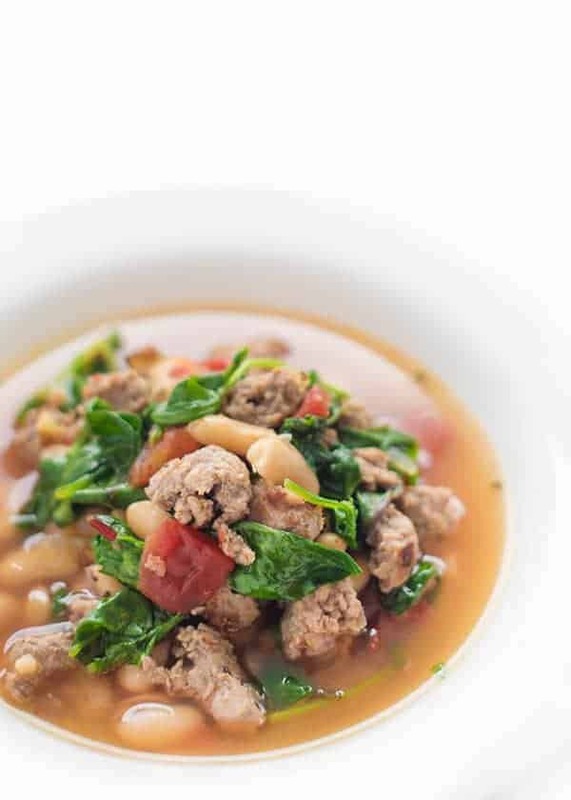 This simple and satisfying soup is packed with Italian sausage, hearty beans and plenty of veggies. A perfect one-pot meal, leftovers are great for lunch the next day or freezing for later. Heat a large Dutch oven or soup pot over medium-high heat and spray with cooking spray. Remove sausage from casings and add to pan. Cook until browned, 8-9 minutes, using a wooden spoon to break down into bite-sized pieces. Remove from pan and set aside. In the same pan, add diced onion, carrots and celery. Add a pinch of salt and pepper to get the juices released from the veggies and cook until tender, about 7-8 minutes. Add garlic, chili flakes and bay leaf. Cook for 30 seconds to release flavors then add beans, cooked sausage, broth and diced tomatoes. Bring pot to a boil then reduce heat to low. Simmer for 30 minutes or until beans are tender. Serve with chopped parsley and parmesan. This recipe makes a very large batch which is intentional. I love freezing half of it for another busy night or saving it for lunch throughout the week. 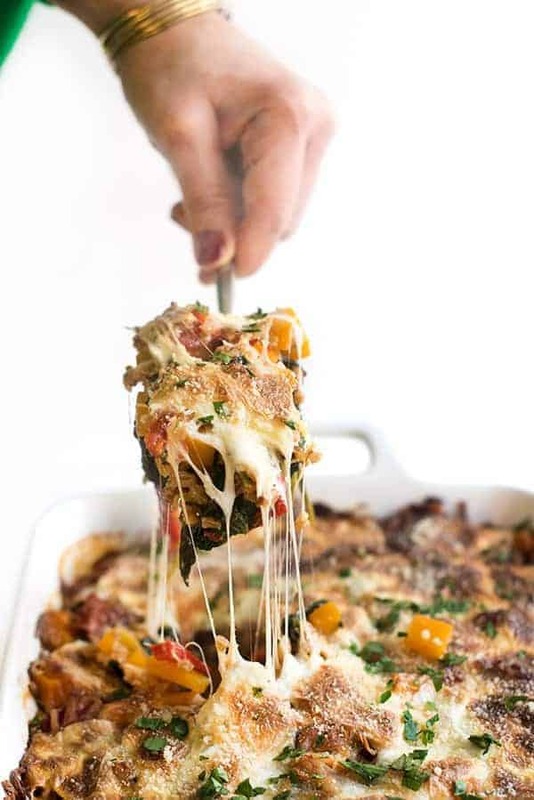 Of course, you can always reduce the recipe in half to avoid leftovers. This is the second time I’ve made the soup. It’s so so good. I use fire roasted tomatoes. I love the smokeness it adds. Definitely a favorite! just wondering…can I add leeks to the dish? I made this yesterday but cut the recipe in half since there’s only 2 and used can of Cannellini beans since I didn’t have time to soak dry beans (which I love) and it was delicious! I will definetly make this again and I don’t cook! So glad you enjoyed it Ali!! The recipe doesn’t say when to add the sausage back to the soup. Can someone tell me when it is best to do this? Oh my goodness my apologies!!! I have updated the recipe but you add it back when you add the beans and tomatoes. So sorry about that. :-) I hope you enjoy the soup! I’m glad I’m not the only one that thinks the pasta is completely unnecessary in minestrone. Don’t get me wrong – I’m a big pasta lover. But I’ve never found it to the best part of a soup like this. The best part of a soup like this? The fact that it usually gets tastier after a layover in the fridge and a re-heat. Love this recipe! Oh my goodness I hope you like it!! Stay warm!! Oh it’s going to be soup season for awhile here!! :) Stay warm! I love a good, hearty soup in the winter! This looks so healthy and delicious. You and me both!! Hope you and the boys are doing well! Love, love, love this soup! I’m gonna’ need two bowls, my friend! Let’s make it an even 4 bowls!! Oh my… I’m all for a hearty pot of soup! Oh I know my hubby would love this. Pinning! Soup is one of the things that makes winter tolerable. Those are some beautiful beans! I have definitely been in soup all-day-every-day mode (and LOVING it!). I love how there is so much going on in this…beans, sausage, veggies…there is a little bit of something for everyone! Oh man me too!!! It’s best for lunches!! Pretty beans! I want them in my tummy. In this soup form. As fast as possible (I blame the baby in my belly for the impatience ;)). You better make them for baby!! I love any soup with Italian sausage and beans. It’s just so satisfying and flavorful! You and me both Courtney! Soup in the middle of winter is my comfort food too! Nothing beats a steamy bowl of soup when it is 20* outside! This sounds amazing! Honestly!!! I am so over winter at this point! Very pretty beans! :) This soup looks perfect for this freezing February.